(Bloomberg) -- China’s efforts to keep its next tech superstars at home are showing some early signs of success. Since March, Qingdao Haier Biomedical Co., Sun Car Insurance Agency Co. and Certusnet Information and Technology Co. have scrapped plans to list in Hong Kong and are expected to debut on Shanghai’s new board instead. While the Chinese city is yet to attract any of the country’s mega startups, it’s a vote of confidence from entrepreneurs after regulators said the venue will have looser rules for initial public offerings. Though China has plenty of locally cultivated technology firms, the country’s valuation cap and a ban on unprofitable firms has led many of its biggest names to pick venues in Hong Kong or the U.S. instead. The Science and Technology Innovation Board, which was first touted by President Xi Jinping in November, is the government’s latest attempt to stop the exodus. Qingdao Haier Biomedical, which makes storage equipment for biomedical samples, is already on the tech board’s official list of candidates. Certusnet, a software provider, has received board approval to list in Shanghai but has yet to file an application. Representatives for Qingdao Haier Biochemical didn’t immediately reply to an email seeking comment on the company’s choice of venue, while attempts to contact Certusnet were unsuccessful. Sun Car, which pulled its Hong Kong IPO last month, said at the time it was evaluating the latest stock-exchange developments both in China and Hong Kong. The announcement triggered speculation that the insurance agency plans to apply for the tech board. Calls to the firm went unanswered. Shanghai MicroPort Endovascular MedTech Co. -- which was spun off by Hong Kong-listed MicroPort Scientific Corp. -- submitted its application to list on the tech board on Thursday. 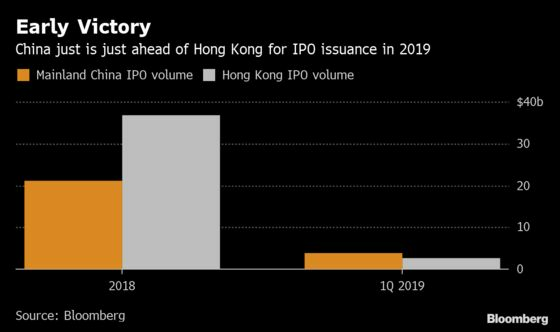 Shanghai’s new board will be the first to waive China’s valuation cap, an unwritten rule introduced in 2014 that’s kept IPO multiples at or below 23 times earnings. As well as less stringent restrictions on first-day trading and an applicant’s earnings track record, regulators also allowed for shares with unequal voting rights which often give founders greater control. Some analysts say the board, which had accepted more than 60 applications as of Thursday, may launch as early as June. Hong Kong Exchanges & Clearing Ltd. Chief Executive Officer Charles Li has tried to play up the positives of the new board for his bourse, saying international investors will still transact via the trading link he built with China’s exchanges. While the hype remains high, investors have so far been unimpressed with the first batch of applicants, saying that the firms were similar to the small caps already trading on Beijing’s over-the-counter exchange. The question is whether Shanghai’s pull can be strong enough to also capture China’s more well-known companies. Analysts say a smooth start in Shanghai and a successful trial period may eventually attract bigger startups to the country’s $7.4 trillion equity market.